At the end of Nesbo’s last book, Phantom, a lot of us thought Harry Hole was dead. 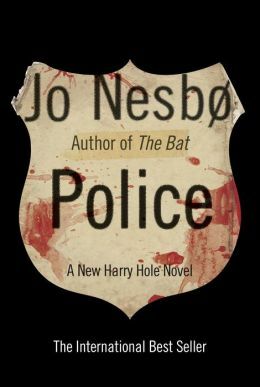 Since Police is being marketed with the tagline “a new Harry Hole novel”, I don’t think its too much of a spoiler to reveal that Hole is still alive… at least when Police starts. There is a killer on the loose in Norway, and he seems to be targeting police officers. Is his motive revenge, hatred, or even love? The politicking at police headquarters impedes rather than advances the case. A few who have worked with Harry Hole try to form their own task force and solve the crimes like he would. But can they do it without him? This novel is typical of all the Nesbo has written in the Harry Hole series; that is to say, excellent. Psychological analysis, modern forensics, and old-fashioned beat cop detecting all play a role in solving the case. The case takes unexpected twists and turns that keep you guessing (and turing pages) up until the end. A story arc involving the corrupt chief of police and his henchman gets wrapped up. But is it as good if there is no Harry Hole? You have to read the book to decide. My feeling is that this just might be the final Harry Hole book (altho Nesbo has fooled us before.) If, in fact, it is- I’m not disappointed with this farewell to the character. For once he might have a book where he doesn’t disappear into an alcoholic drinking binge/blackout. For once he might get to be happy with his long-time off-and-on girlfriend Rakel and her son Oleg. I’m only disappointed because I never wanted to say goodbye to Harry. Oh, I know, characters are usually better if they say goodbye before we are quite done with them. But 9 Nesbo books (in English) over the last few years have made me rather attached to Harry Hole. He is, in my opinion, one of the greatest fictional detectives of the last 20 years. Other characters in the running for the best detective of the last 20 yeats: the fictional Pendergast of Preston and Child. the fictional House of TV. the fictional Lincoln Ryhme of J. Deaver. the fictional Temperance Brennan of K. Reichs. the fictional Sherlock of the BBC. This entry was posted in Fiction, Top 10 and tagged book review, detective, fiction, mystery. Bookmark the permalink.